Bath City Football Club has revealed its plans for a revamped stadium. As well as a new grandstand, the stadium will include a community hub, a gym and an all-weather pitch, which the community can use, as well as an upgrade to Twerton High Street. Club chair Nick Blofeld said: "This redevelopment will secure the financial future of the club." City became a community-owned club in May 2017 after supporters successfully raised more than £300,000. It enabled the National League South club to clear historical debts and put a plan in place to generate revenue while remaining in Twerton. Members of the public are now being invited to view the latest designs. The redevelopment includes student accommodation, 12 affordable housing units prioritised for local people and 34 "co-living apartments", aimed at graduates and young workers. The plans are the result of a joint scheme between the club and Greenacre Capital for land to the rear of the High Street and part of Twerton Park. Mr Blofeld said: "This multimillion-pound scheme will help rejuvenate the High Street, create new employment opportunities, provide affordable housing for local people, improve public areas and deliver better community facilities. "The new sports facilities will give Bath City FC, its staff and players, the modern resources we need, but they will also be available to the local community." All of the exhibition information is also online. 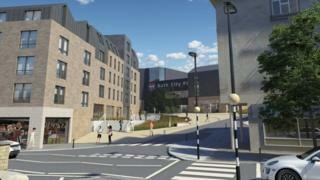 Bath City FC and Greenacre Capital will then submit a planning application to Bath and North East Somerset Council.